Finally, after 2 months back in the US we get to 'stick a new sticker on'! Yes we've reached our first 'new' state in I don't know how long...(September last year I think!) - North Dakota!! This is our 31st state. We based ourselves in the Theodore Roosevelt National Park for a couple of days. This is just 25 miles east of the state line with Montana. 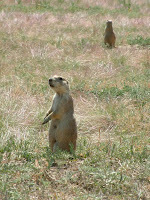 It's a wild place, full of badlands, prairie, herds of bison and dozens of prairie dogs (these little critters are just too cute!!). We went on long hike on our first morning - 12 miles across said landscape, crossing little creeks (more times than I care to remember - why the trail couldn't just keep us on the same bank the whole way I have no idea - I swear we crossed the same darn stream at least a dozen times, and it was getting messy and muddy toward the end!) We started and finished the loop trail in the middle of a prairie dog town (there were even holes dug up right in the middle of the parking lot!) These guys crack me up - think they're 'oh so tough' barking away at you in warning, then as you get closer they dive for cover into their holes, with a wiggle of the tail as a final flourish!!! If you stop and stand still for just a moment the same critter will pop it's head out to case the joint ready to come back out - then you just stare each other out!! Medora is also home of the 'Medora Musical'. This was a kind of variety show meets broadway kind of performance. Set in the fabulous Rolling Hills ampitheatre just out of town it's an outdoor venue with a backdrop of the ND badlands - the setting itself was worth the ticket price. It was 2 hours of great 'family' entertainment - singers, dancers, a band, a yodeller (who was amazing! ), an African acrobatic troupe, horses, a stagecoach and a finale of fireworks! Sounds good?! - it was great!! Driving in ND is a little dull - long straight roads, and the weather has been hot making it pretty uncomfortable. However they sure know how to break up the monotony...introducing 'Salem Sue'!!! This is the worlds largest Holstein cow (presumbably there's a larger one, but of a different breed...surely not!!!!). She's 3 stories high and perches atop a hill overlooking the highway - we could see her from at least 3 miles back!! North Dakotans - they're nutters - they spent $40,000 on Salem Sue back in 1974. Still it was a fun and welcome break in our journey, and I guess that's the whole point!! Right now we've found another ND gem - the Fort Lincoln state park, near Bismarck. The campsite is great and we're cooling ourselves off here (with some much needed aircon - one of our indulgences - we prefer to live without it usually) during a little mini ND heatwave it seems. We're right next to the Missouri river and the park is home to an old Indian village dating back to the 1500-1700's. There's also an Army fort which was used as one of the major staging posts in the Indian wars in the 1870's. Spent the last week in Idaho. What an amazing place!! Loved it! The Sawtooth National Recreation area in particular. Lots of mountains, the Salmon River winding it's way through, green fields and lots of hiking (40 miles in the last week!) and we even managed a spot of easy going river rafting (not the white water variety this time!). Also discovered the joys of camping in the National Forests and Recreation areas - as well as all the 'developed' campsites they have plenty of freebie places too - basically anywhere that has already been used for the purpose! Bizarrely one place was pretty much a campsite to us - it was an overflow area for the popular Redfish lake and there were well marked sites, firerings and a toilet and it was free - 200 yards down the road was the turning into the 'real' campground costing $11 a night!! (OK so I realise we're not talking big bucks savings here but even so!!). We camped out at some beautiful spots right next to the river (such a great sound to lull you to sleep! ), in real solitude. Watched a wild storm come over the mountains in the distance one afternoon but we got lucky - it never reached us. The Sawtooth area is also a hotspot for natural hot springs - discovered a couple along the roadside and along the river the day we went rafting - a good way to warm through after being in the chilly river water for a while! It's been a busy week and a half; we got to Bend, Oregon 10 days ago after driving north from Crater Lake and found ourselves in probably the nicest campsite we've (ever?) stayed in. It has all the facilities of a private campground but each site is tucked away in its own clearing in the woods making it more like a National or State Park - only civilised! Bend itself is a wonderful place; it's close to the ski resort of Mt Bachelor, and this time of year it is full of hikers, mountain bikers, climbers and general outdor types - so it has a great vibe. It also has a fair smattering of micro breweries and their beer gardens; who says America can't make decent beer!!! So most of our days have been hiking along the gorgeous Deschutes River, or kayaking down it, (being bowled over by the most amazing houses that pop up out of the forest on its banks every mile or so) followed by the occasional pub lunch! Whilst we were in the area, (200 miles away is in the area over here!) we took the opportunity to re-visit Jan and Kase, (distant relatives on Helen's side) who live over in Portland. We spent a great couple of days with them, eating well and lazing in their huge hot-tub in the cool clear night - thanks guys! Of course it has been 4th of July this week so the country has been celebrating their independence from us; although naturally we've been made very welcome wherever we go. There's many celebrations - and of course they do it in style. Every place, person, vehicle, pet etc has been covered in red, white and blue bunting, flags have been out even more than normal and every spare acre of public land seems to have a picnic, a b-b-q, fireworks or some sort of party going on. We went to the local fireman's picnic where the kids were being encouraged to have hose fights; like a tug-of-war but instead of pulling the other team over, you just knock them down with high pressure water. I had a deprived childhood! That evening there was a free concert laid on at one of the resort golf courses called "Rhythm on the Range". The golf course was littered with picnic blankets and easy chairs and there were tents selling candy floss, hot dogs, burger etc and of course the obligatory beer tent where you could buy wine in a glass - yes, a real glass, made out of glass! Imagine that at an outdoor event at home! Tomorrow we're leaving the area for Idaho and the Midwest; we now have less than three weeks to get ourselves across four states, covering 1800 miles to pick up the other Helen, (my sister) and her two kids Callum and Lauren for what we hope will be their holiday of a lifetime!